The Kings Mountain campaign is one of the turning points of the American Revolution. The British commander in the Southern Colonies, Lord Charles Cornwallis, anticipated strong Loyalist support in the Carolinas. Major Patrick Ferguson, an experienced and charismatic officer, was appointed Inspector of Militia for the Southern Colonies. Ferguson enjoyed early success at this task. With several hundred members of this Loyalist militia supported by 120 provincial regulars from the northern colonies, Ferguson attempted to end Patriot activity on the frontier by issuing a threat to the "backwater men" to stop supporting the rebellion. This threat angered the fiercely independent Overmountain Men and militia companies of the backcountry. The result was a call to arms similar to the patriot militia in Lexington and Concord in 1775, as militia and frontiersmen formed a loosely organized army to chase Major Ferguson's force. The Patriots hotly pursued Ferguson and his loyalist militia on horseback to Kings Mountain, South Carolina, where on October 7th, 1780, the two forces clashed for nearly an hour. Ferguson and 206 of his men lay dead on the mountain. Loyalist forces numbered 128 wounded and 648 taken prisoner. After suffering the loss of Ferguson and his Loyalist force, the main British army was forced to retreat to South Carolina for the winter. This allowed time for the Americans to organize a new southern army under General Nathaniel Greene. The pursuit and defeat of Ferguson by the Overmountain Men and local militia represents what Thomas Jefferson called "the turning of the tide" in the American Revolution. Soldiers on both sides were mostly militia, not professional soldiers. They dressed in civilian clothes, such as the figure on the right. The militiaman depicted here is armed with a smoothbore musket, which could be tipped with a bayonet and was accurate up to 70 yards. Most Loyalists carried these weapons, while Patriots were armed with more accurate rifles. Major Ferguson's force also had about 120 men of the American Volunteers who were clothed and trained like British "redcoats." 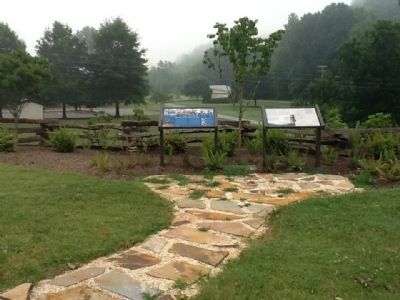 Erected by Overmountain Victory National Historic Trail (National Park Service). Elkin Highway (State Highway 268), on the right when traveling east. Touch for map. Marker is in this post office area: Elkin NC 28621, United States of America. Touch for directions. Other nearby markers. At least 8 other markers are within 12 miles of this marker, measured as the crow flies. 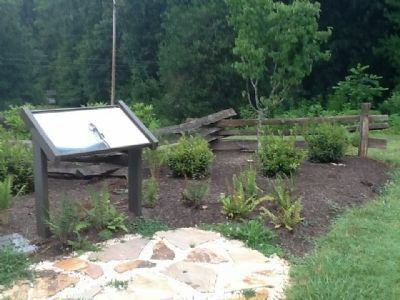 Surry County Muster Site (a few steps from this marker); Surry Muster Field (within shouting distance of this marker); Elkin Manufacturing Company (approx. ¾ mile away); Jonesville (approx. 2.2 miles away); Benjamin Cleveland (approx. 5.1 miles away); Richard Allen, Sr. (approx. 8½ miles away); North Wilkesboro Speedway (approx. 11.2 miles away); Flat Rock Baptist Church (approx. 11.7 miles away). Touch for a list and map of all markers in Elkin. More. 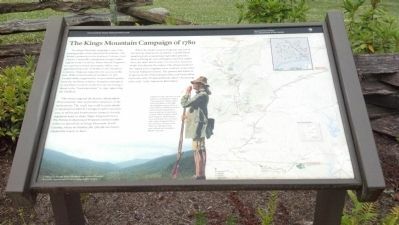 Search the internet for The Kings Mountain Campaign of 1780. Credits. This page was last revised on June 16, 2016. This page originally submitted on June 30, 2012, by Michael C. Wilcox of Winston-Salem, North Carolina. This page has been viewed 408 times since then and 5 times this year. Photos: 1, 2, 3. submitted on June 30, 2012, by Michael C. Wilcox of Winston-Salem, North Carolina. • Craig Swain was the editor who published this page.